TOP: A sign warns motorists of the one-lane bridge ahead on the way to Tsé Lichii Chapter House. 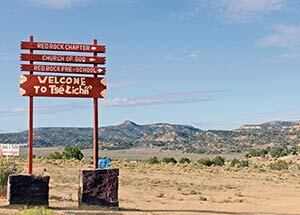 BOTTOM: A welcome sign is posted at the entrance to Tsé Lichii Chapter House south of Gallup. The first thing you will notice about Tsé Lichii ("Red Rock") Chapter is that it is one of the few places on the Navajo Nation where the rocks are not red. They're more of a blond color. You have to know the story. "The way I heard it," said Chapter President Ray Jack, "a group of people were coming back from the Long Walk. They camped near Breadsprings, and in the morning the sun was hitting one of the mesas here. It was glaring red in the sunlight. They said, 'That's where we should go and settle.'" Over the years, the Navajos of Tsé Lichii (the name was changed to the Navajo from "Red Rock" in 2011 to avoid confusion with the Gallup neighborhood of Red Rock) watched the town of Gallup grow up over the hill to the north. The economies of the two communities were intertwined, with the Navajos trading sheep, wool and rugs for groceries and provisions. Since World War II and the advent of a cash economy, the balance has swung decidedly in Gallup's favor. The residents of Tsé Lichii commute the few miles into "town" to work, shop and recreate; Gallupians have little reason to head south. That is all, say the chapter officials, about to change. "Gallup," declared former Council delegate and current community land-use planning committee member Ida Nelson, "is done growing." If you dispute that, all you have to do is look at a map. The city is surrounded on all sides by Indian reservations, and it has pretty much pressed its borders to the limit. "If they want to expand," Nelson said, "they'll have to talk to us." The truth is, they're already coming around. A company proposing a metal recycling plant has inquired about a business-site lease; the county is talking about a sheriff's substation and a fire station. Tsé Lichii is getting prepared. It has withdrawn 248 acres for a new chapter compound that could include the substation and firehouse, and another 100 for business sites. It has turned in all its paperwork for certification, so it can tax any businesses that pop up. "Soon we'll take over," said Chapter Secretary Louise Hoskie, grinning like a comic-book evil genius. "We'll be bigger than Gallup. We'll have our own Walmart. (Highway) 602 will be four lanes." That will be down the road a ways, said Community Services Coordinator Anderson Lee. But a flea market and convenience store are definitely doable. "Our Zuni neighbors travel '602 every day," said Nelson. "I'm sure they would love it if we had something here for them and they didn't have to go all the way into town." There's a bit of a love-hate relationship with Gallup here. The larger town is so close it has eliminated a lot of incentive for businesspeople to set up shop in Tsé Lichii. On the other hand, it's so darned convenient. "When I meet with CDCs from the other chapters," said Lee, "they're always complaining they have to drive miles and miles just to get to a bank or to get materials for a project. We just drive over the hill." Perhaps being so close to the border town allowed Tsé Lichiites to experience the racism and inequities that led to the Red Power movement of the 1960s and 70s. Herbert Blatchford and several other noted activists hail from here, as does Felix Begay, McKinley County's first Navajo sheriff. Name: Changed to the Navajo translation of the previous name, Red Rock, in 2011, it refers to a butte lit up by the morning sun. The rock here is not red but more of a blond color. It also has given rise to a determination to keep from being culturally swallowed up. "You'll find us a unique community," Jack said. "We want to modernize, but we're very rooted in our language and cultural values." You won't hear English at a chapter or CLUPC meeting, or even a project meeting like the one that was being held the day the Times visited. If young people want to be a part of this community, they need to learn Diné bizaad. So the young don't feel left out, there are activities planned just for them -- cookouts, volleyball games and the like. In terms of infrastructure, Tsé Lichii is way ahead of most Navajo chapters. One hundred percent of its citizens have running water and 80 percent have electricity. They're planning on making that 100 percent within the next year and a half, with Internet access next in line. 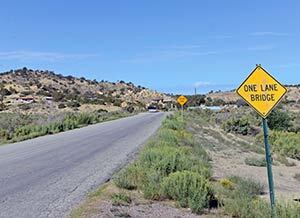 The Gallup-Navajo pipeline ends here, providing the promise of water for future development. Roads are another story, sandy and treacherous, with a rickety one-lane bridge along the only northern entrance to the chapter compound. The chapter is always lobbying McKinley County, the BIA and anyone else who will listen for asphalt. Its ambitious goal is to have pavement "right to everyone's house," within the next few years, according to Hoskie. The positive attitude is a legacy. "We've always had really good leaders here," Nelson said. She recalled when she was first contemplating running for Council, the first woman delegate from her chapter. "A lot of people were saying, 'You shouldn't run,'" Nelson said. "But then (former chapter president) Charles Lee and (former grazing official) Charlie Y. Begay pulled me aside. They asked me a whole lot of questions. "After that, they supported me, and I won the election. I was in for two terms. I think I'm the outspoken person I am today, because of them."